That’s the title of my new book. It didn’t happen to me, I wasn’t even born when Rudolf Reder lived through those terrible times. He was the only post-war survivor of a death camp in Poland called Belzec. Most people have never heard of it, but in just 18 months 700,000 people (almost all Jews) died there. 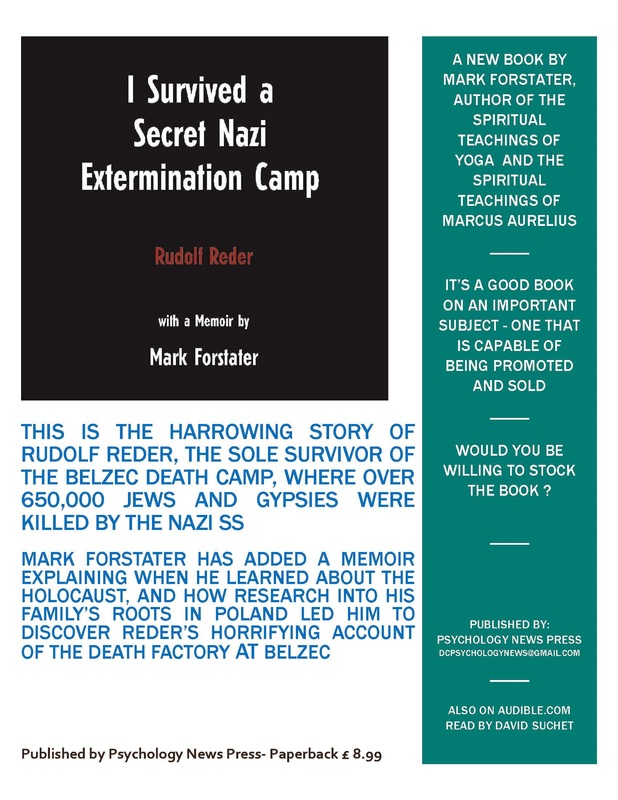 We only know what happened in this death factory because Reder managed an incredible escape, and after the war told his story to a Jewish Historical Commission in Cracow who were trying to gather evidence against the Nazi criminals. The victims who arrived by freight train to Belzec were killed in the gas chambers within two hours. The Nazi system processed these people like cargo. The only people who survived longer were Jews who were selected to work at the camp, and they only lasted a few months at most. Reder lasted for 4 months because he was an engineer and could fix the tank engine which produced the carbon monoxide which was the killer gas. I found out about Belzec and Reder’s story when I made a trip to Lublin in Eastern Poland to research my Granfdfather’s roots. While I was there I visited Majdanek Concentration Camp and there I found a slim book called Belzec which contained Reder’s witness statement. My young Polish guides explained to me that Belzec was where the Jews from Lublin were sent to die, so it is very likely that some of my relatives were killed there. I never knew that I had relatives killed in the Holocaust until I made this trip. Now I am waiting for the book to come out, and I need to find ways to make it known to potential readers. We are starting first in the UK (I live in London) and hope that if we can make a bit of a splash that we can find a publisher in the US. An ebook will follow in a few months. I decided that Reder’s statement was so strong and powerful that I needed to make it more widely known. So I decided to make an audio out of it (soon to be on Audible) and wrote an account about how I found the text.